Just two weeks ago, my kid got a 60198 cargo train and we added a set of 60238 switching tracks. With two (out of three) switches we have the problem that the switch doesn't close properly anymore to perform the lane change (the position to go straight is fine). As you can see the movable rail part doesn't completely close against the fixed rail track, causing the wheels to miss the turn. The train either just goes straight (best case) or de-rails (worst-case). Any idea what the cause is, and is there anything I can do to fix this? This happened with two different sets, bought about 5 months apart (but put in use at same time) with two different vendors across Europe, so I'd be surprised this to be a 'bad batch'. I've also tried reversing the locomotive to check it isn't because the wheels are misaligned, but both the powered and non-powered wheels give the same result. On first sight it looks like there is a spring in the switch which got stuck/compressed/..., but I have no idea how to open this without breaking the track. So, how does it work then? Well, let's open it up! The backplate is held into place by 14 pins. We'll carefully pry it open with a knife. Alternatively, we could use a drillbit to slowly scrape off the pinheads. Both methods are destructive. The backplate needs to be glued back on later. Once we can lift off the backplate, we already got the slider. Next we'll unplug the switch. Let's take a pair of pliers and carefully -just a bit!- squeeze the peg, then push it out. Yellow: The slider is of a soft plastic. Notice the oval hole with a nose. When you move the slider this bit gets squeezed and then snaps into position. There's two stops, they have a figure 8 shape. Red: At the end of the slider there's a single tooth. This tooth flicks the switch. Green: The switch has a peg and a spring. The spring has two legs. The tooth is supposed to sit right between them. So much for starters. Now, what about your points? In any case, use some compressed air first. Switch them repeatedly. Maybe it's just a grain of dust. Still not functioning properly? Can you still return them? Can it move freely? Does it 'snap in'? Does the spring have enough tension? 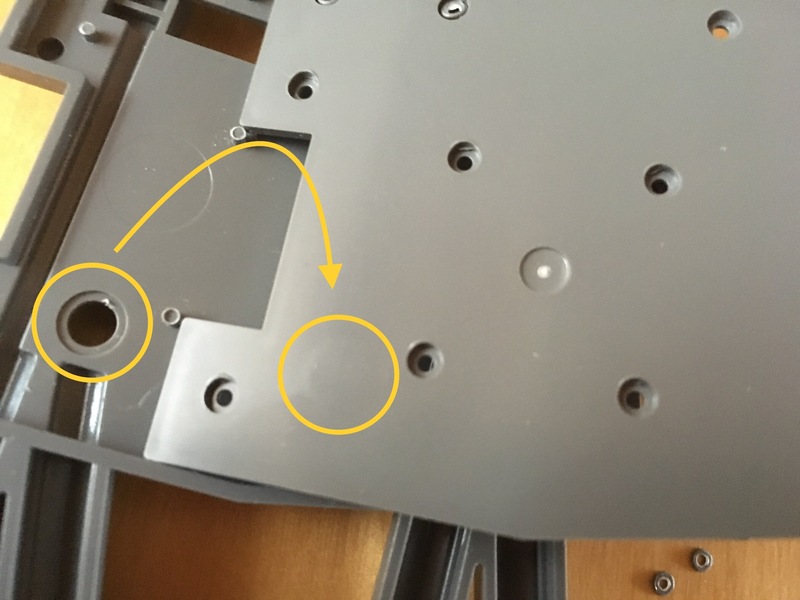 If the slider's malfunctioning, you'd have to remove the backplate. However, if the spring's your suspect there's a less destructive way. In theory, one could try to pry out the switch with a flat screwdriver. I didn't dare it. 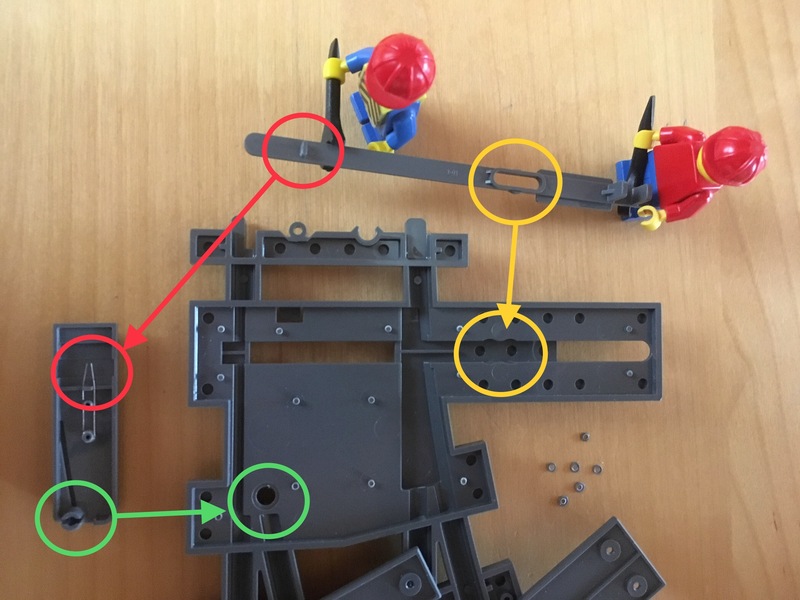 Parts could warp, the peg could break and I think LEGO did their best to prevent creative kids from doing it. But take a look at the backplate. You can barely see it, but there's a circle. It's right on top of the peg. 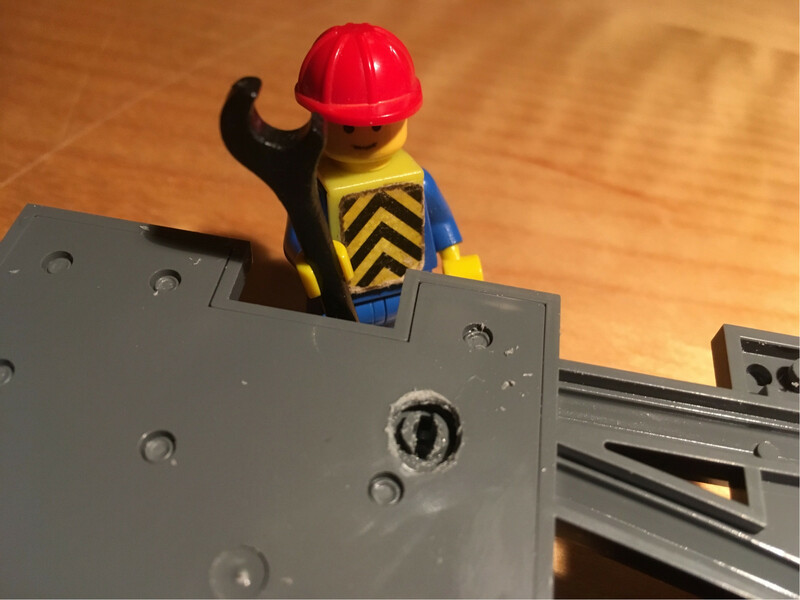 I took a drillbit and started to slowly scratch off some of the plastic. Once the tip was through, I finished off the rest with a scalpel. Take your time! The plastic is quite thin and the peg's right under it. I could now easily access the peg with my pliers and push it out. I adjusted the spring and lined everything up. This might also work, but I dont recommend it. I gave it a try. It's way too fiddly. Take a scalpel and cut a hole in the side of the switch. Now you can take a peek inside. See if the tooth is off-center. If so, try to lift the corresponding leg of the spring with a needle. Good luck. Not the answer you're looking for? Browse other questions tagged trains tracks or ask your own question. 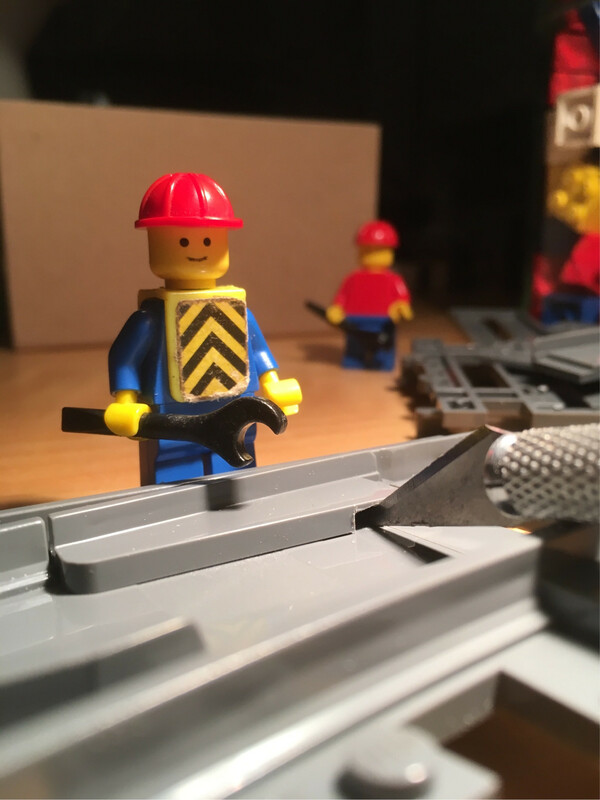 What advanced railroad features are possible with the Lego PF train sets? What is the maximum distance between fixed train wheels? 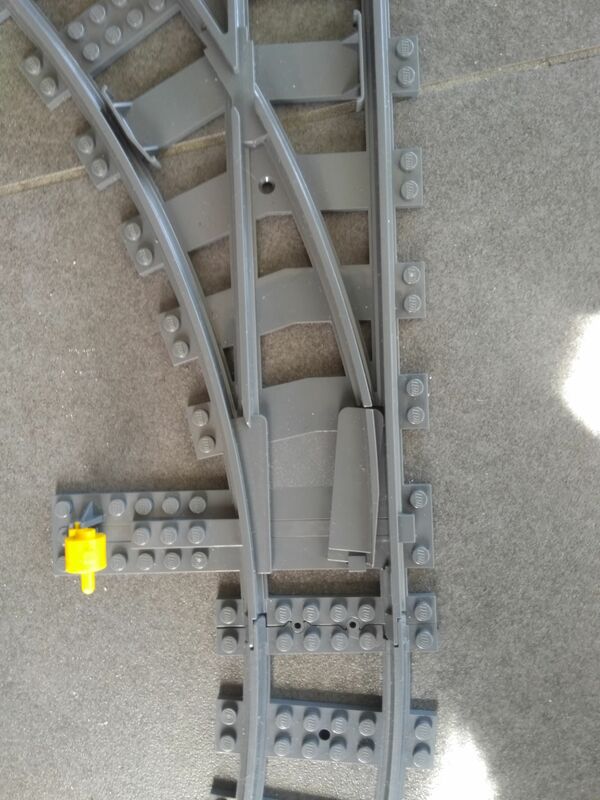 Software to do Duplo train track layout? How to build an automatic Lego train system? How can I prevent my train from derailing? 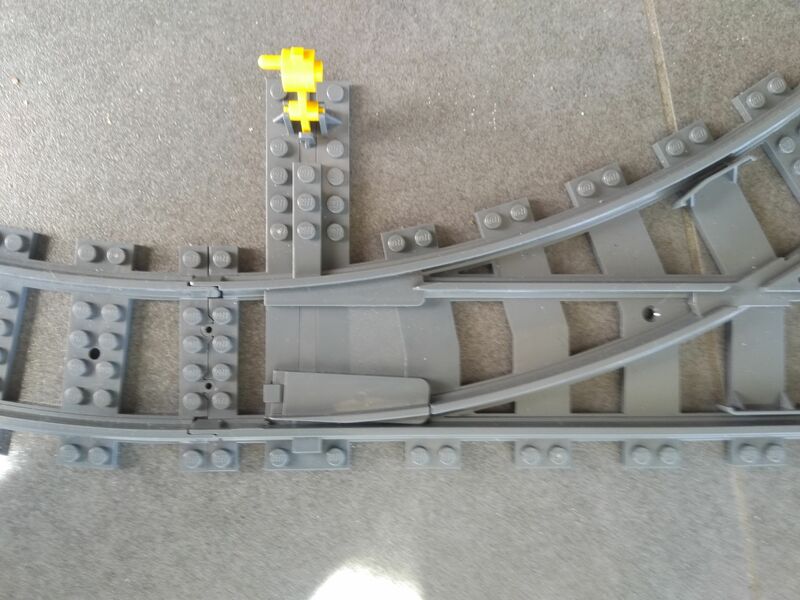 How can I stop the LEGO Cargo train 60052 wheels from skidding on track? Is the Lego Duplo Track System being discontinued?